Someone recently uploaded two of my figures claiming them as his own. That's not OK, so here's one of them. 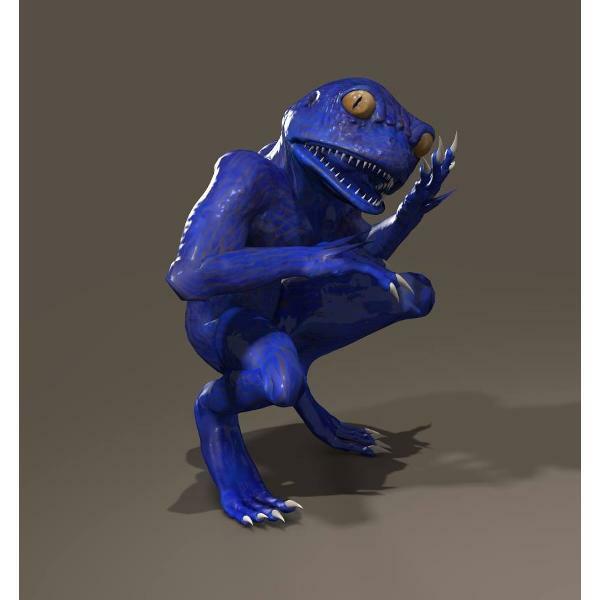 This is a Blue Slaad based on the illustrations in the 1st edition AD&D Fiend Folio. It is NOT "Amphibian man." -- Whoever repackaged my figures up and claimed they had permission is, in fact, not telling the truth. Please do not dowload from that person. BiohazardZero (1 year ago) Inappropriate? Sorry someone ripped off your work and claimed it as their own. That's happened to me at least once that I know of too. It's not cool when it happens. I empathize. DisneyFan (3 years ago) Inappropriate? SKSKSK (3 years ago) Inappropriate? a Slaad- thats awesome- Thank you. They are a fun combination of slightly creepy but cool. Got any Gith-yanki or Kuatoa? I thought something was off about that post, I thought maybe you were using an alt for some reason. I really don't get why people do that. I see plebes on DA who post nothing but stolen work. Why do they do that, is it just a sad plea for attention? Dodger (3 years ago) Inappropriate? Seriously, what sort of moron thinks you can just redistribute things unless told otherwise? It has been taken down now. Not sure if by the site or by the user himself. 17 U.S. Code Â§ 106 "...the owner of copyright under this title has the exclusive more …It has been taken down now. Not sure if by the site or by the user himself. 17 U.S. Code Â§ 106 "...the owner of copyright under this title has the exclusive rights to do and to authorize any of the following...to distribute copies...of the copyrighted work to the public by sale or other transfer of ownership"
The Characters are from threednd web site if that is you you did not post any copyright restrictions regards re-share but i did change my download file on Sharecg with a link to this site only and changed the artwork as well. I do not upload anything that is copyright infringment. No need to delete anything you got from this other guy. Looks like his ZIP file contains 2 folders, each with the ZIP file he downloaded from me, as-is. I just would rather people get these from my site, as I'm trying to build up traffic. They're both freebies. But that ZOMBIE guy should really not be taking credit (or miscrediting to x2000) and he should not be sitributing things more …No need to delete anything you got from this other guy. Looks like his ZIP file contains 2 folders, each with the ZIP file he downloaded from me, as-is. Sorry to hear about the theft of your work. I have erased those files from my downloads. Thanks. Love old first edition DnD. Sorry to hear that fellow is plagiarizing your work. He most not be too bright. Thanks, I read your post on the other page and came here instead.